The triumph of Solidarność counterrevolution in Poland nearly 30 years ago ushered in imperialist-dictated “shock therapy” that razed the collectivised foundations of the former bureaucratically deformed workers state and reduced much of the population to penury, forcing many Polish workers to seek a livelihood abroad. Accompanying this devastation was the steady drumbeat of a reactionary crusade reasserting the dominance of the Catholic church over Polish society and glorifying the interwar Poland of Marshal Jozef Pilsudski and the ultraright National Democrats (Endeks). As the Nazis began liquidating the Warsaw Ghetto in 1942, the AK’s Antyk (Anti-Communist) department declared: “The extermination of the Jews in Europe by the Germans... represents from our point of view an undoubtedly favorable development, for it will weaken the explosive power of Communism” (quoted in Reuben Ainsztein, The Warsaw Ghetto revolt ). After Soviet forces defeated the Nazi occupiers, the NSZ and remnants of the AK — today dubbed “cursed soldiers” — waged a war of terror, assassinations and pogroms against Soviet soldiers, Communists, Ukrainians and Jewish survivors. As the Spartacist Group of Poland has noted previously: “Hitler’s war against ‘Jew-Bolshevism’ fit in neatly with the Polish nationalist myth of a ‘Jewish-Communist’ conspiracy against Poland” (Platforma Spartakusowców no 20, April 2016; reprinted in Workers Hammer no 235, Summer 2016). The International Communist League is committed to the forging of a revolutionary internationalist party of the Polish proletariat. As a necessary task in this struggle, the SGP seeks to sear into the consciousness of the working class the record of the Polish bourgeoisie’s complicity in the Nazi extermination of the Jews. Trotskyists said: Stop Solidarność counterrevolution! The enactment of the Holocaust law was met with hypocritical protest from Polish Civic Platform (PO), the parliamentary opposition party, whose embrace of the European Union makes it more sensitive to imperialist “public opinion”. As well, many liberals warned that the law would suppress historical research and debate. We oppose all state censorship. However, the criminal role of the interwar Polish bourgeoisie and its World War II anti-Communist cut-throats is not a matter of debate but of historical fact. The record of Polish nationalism, suitably prettified for Western consumption, is embraced by all parties of the Polish bourgeoisie, including the PO as well as the PiS. In 2011, the PO-led coalition government commemorated the postwar terrorists by declaring 1 March a “National Day of Cursed Soldiers”. In 2017, the PiS-dominated Sejm (lower house of parliament) further honoured these anti-Jewish and anti-Communist killers, by acclamation, for making “a valuable contribution to the Homeland” because “NSZ troops never accepted the Soviet Union’s conquest of Poland and the imposition of Communist rule.” Meanwhile, at 11 November “Independence Day” celebrations, government leaders stand side by side with outright fascists howling, “Communists will hang on trees” and “Save Europe from emigration.” We Trotskyists say: All honour to the millions of Red Army soldiers and officers who died liberating Eastern and Central Europe from the Nazis! Interwar Poland was a capitalist dictatorship enforcing intense exploitation and marked by virulent chauvinism, anti-Communism and anti-Jewish bigotry. It was also deeply oppressive of the Ukrainian and Belarusian national minorities. The Red Army’s entry in 1944-45 was welcomed by wide swathes of the populace. The Polish People’s Republic that was later erected as a result of the Soviet presence marked an end to the capitalists and landlords and their pogromist gangs; provided jobs, healthcare and education for all; and freed women from the draconian dictates of the church. However, decades of Stalinist bureaucratic mismanagement under the dogma of “socialism in one country” — which included conciliation of the Catholic hierarchy and peasant smallholders and the mortgaging of the economy to the Western bankers — ultimately drove much of the working class into the arms of Solidarność and its CIA and Vatican sponsors. Standing on the Trotskyist programme of unconditional military defence of the Soviet degenerated workers state and the bureaucratically deformed workers states, we called for the smashing of Solidarność from the moment it consolidated around an open programme of capitalist restoration in 1981. At the same time, we fought for a proletarian political revolution to oust the bankrupt Stalinist bureaucracy. As we warned it would be, Solidarność was the spearhead for capitalist counterrevolution throughout Eastern Europe and in the Soviet Union itself. The purpose of the Holocaust law was clear from the choice of its first target in March 2018: a press article about a 1941 massacre of Jews illustrated with a photo of “cursed soldiers” executed by the postwar Soviet-backed government. The article, published in the Argentine newspaper Página/12 in December 2017, was based on the book Neighbors (2001) by historian Jan T Gross, an account of the July 1941 Jedwabne pogrom. As further documented by liberal journalist Anna Bikont in The crime and the silence (English edition, 2015), Jedwabne was one of many towns where Endeks and local priests organised anti-Jewish pogroms in the days after Soviet troops pulled out from eastern Poland following Hitler’s invasion of the Soviet Union in June 1941. Bikont also described the chauvinist anti-Jewish rage directed at those who exposed or condemned the pogroms. Facing international pressure, especially from Israel and the US, the Polish government quickly stopped the prosecution of Página/12 and finally agreed in June to remove the threat of criminal penalties from the new law. PiS prime minister Mateusz Morawiecki declared: “Those who say that Poland may be responsible for the crimes of World War Two deserve jail terms. But we operate in an international context and we take that into account.” This is a cynical nod to fascists and other nationalist vigilantes who operate “outside the international context” to go after perceived “enemies of the Polish nation”, as they have already in terrorising guides at the Auschwitz memorial. For its part, the Israeli government of Benjamin Netanyahu, butchers of the Palestinian people, signed off on a statement asserting that “the Polish underground state supervised by the Polish government-in-exile created a mechanism of systematic help and support to Jewish people” (reuters.com, 5 July 2018). This is such a blatant lie that the government-funded Yad Vashem Holocaust memorial in Israel was compelled to protest that the London government and its underground forces “did not act resolutely on behalf of Poland’s Jewish citizens at any point during the war. Much of the Polish resistance in its various movements not only failed to help Jews, but was also not infrequently actively involved in persecuting them” (haaretz.com, 5 July 2018). The Zionist rulers spit on the memory of Samuel Zygelboim, representative of the reformist socialist Jewish Bund in the government in exile who, in the wake of the 1943 Warsaw Ghetto Uprising, committed suicide in an anguished protest over the lack of assistance to the Jews. Unlike nationalists and liberals, Marxists do not subscribe to the notion of “collective guilt”, which blames an entire people (be they Germans, Poles or Israeli Jews) for the crimes perpetrated by the capitalist rulers and their murderous underlings from other classes. Among the latter in Poland were particularly backward elements of the petty bourgeoisie and the peasantry (as well as some workers), who were incited by bourgeois nationalists and clergy to target the Jews as scapegoats for their own miserable conditions. Some two million ethnic Poles lost their lives under the Nazi occupation, including many hundreds who were executed for hiding Jews. Before the Holocaust, Jewish workers were a vibrant component of the historically pro-socialist proletariat in Poland, which also included Ukrainians and Belarusians. While the bourgeois nationalists in Poland either ignored the suffering of the Jewish people or acted as henchmen for the Nazis, this was not true of the working class. Notably, the main source of support for the beleaguered Jews, including the Warsaw Ghetto fighters, was the Communist-led People’s Guard. As our German comrades noted in a statement of internationalist greetings to Polish workers in the DDR (East German) deformed workers state in 1989: “The revolutionary workers of Poland can proudly remember the instances of heroic resistance against Nazi terror, not least the valiant uprising of the Jewish masses of the Warsaw Ghetto in 1943” (Arprekorr, 22 December 1989). We called on Polish workers in the DDR, saddled with the fresh memory of Solidarność counterrevolution, to join in the fight against capitalist restoration in the DDR and for a proletarian political revolution against the abdicating Stalinist bureaucracy, in order to open the door to the creation of a united red Germany of workers councils. We fought to revive the slogan of the Communist International of Lenin’s time: For the revolutionary unity of the German, Polish and Russian workers! It was this internationalist perspective that won to the ICL the Polish Trotskyist militants who went on to form the Spartacist Group of Poland. “The drive to restore capitalism revives and intensifies all the ‘old crap’ of the prewar social order, from reactionary clericalism to Pilsudskiite nationalism and anti-Semitism. Today there are few Jews left in Poland, but the pogromists are back in force, targeting Roma and Muslims and other immigrants. Yet anti-Jewish bigotry still serves as a battle cry for all-sided bourgeois reaction and clerical nationalism. 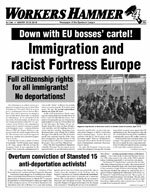 A Leninist-Trotskyist vanguard party, section of a reborn Fourth International, will be a tribune of the people — capable of mobilising the proletariat in the fight for free abortion on demand, for full citizenship rights for all immigrants and for all causes in the interests of the exploited and oppressed. Such was the Bolshevik party that led the first and to date only victorious proletarian socialist revolution, the October Revolution of 1917. The ICL is dedicated to the task of forging new Bolshevik parties to fight for new October Revolutions.